This entry was posted in Forestry and tagged drought, Forester Artist, forestry, salvage, sierras, tree mortality by foresterartist. Bookmark the permalink. I’m so sad when i read these news…where are we going? It is unfortunate to have this much die-off, but it is a cyclical event. During these kind of droughts, like what we are currently experiencing, we expect it. In Northern California we would log the dead trees for lumber and replant the site, but in Southern California there isn’t any infrastructure for such activities. The forest will eventually recover on it’s own, but it will take many years. I’m sure this is going to develop all summer. It’s a strange thing to ‘like’ a story like this one; thank you for making these facts public. This is awful! I had no idea it was this bad. I feel so helpless. Thanks for spreading the news. It is part of the natural cycle in the west. When we have these bad droughts, there is this kind of die-off. It is a combination of drought stress and insects attacking the weakened trees. Unfortunately, in Southern California there is not much infrastructure in place for salvaging the trees and replanting the sites. The forests will have to recover on their own and it will take many years. I have to think there’s almost no regeneration going on there. How are the redwoods and sequoias holding up? Hate to think that trees that have survived more than a thousand years could be killed by this drought. The redwoods live in the “fog belt”, which is a very different environment. I haven’t seen much effect on the coast. Inland the State is much drier, that is where the drought is really taking a toll. The farther south the go the worse it is. However, it is also the very old and weak trees that die at time like this. Trees have a natural life cycle, much like people and stress can push them over the edge. This is quite apparent in my local mountains in the Los Padres Forest. Large swaths of dead and dying pines. It almost looks like a burn area except the needles are still intact, albeit brown and orange. What we need is rain, rain, rain. Indeed, maybe Texas would like to send a little our way. It just breaks my heart….and I know my family is really sad about this, too. We are all fond of trees. In fact, my older son is outside right now transplanting volunteer oaks on our property, and he’s been propagating Kentucky Coffeetrees and Ohio Buckeyes, among other locally native trees. I wish we could magically transport our excess rain to California. Thanks Teresa, we wish you could too. When was the last such die off? During the last drought. This happens every time we get into a drought, which is about every twenty years or so. It’s happening now and it will happen again. It’s just the climate we have here in the west. Hard to watch this happening, but Mother Nature has made some remarkable recoveries in the past so maybe she can pull it off one more time. I agree Alli. These forests will recover. It will just take time. Maybe this news will actually help wake more people up to the devastation to come if we continue to ignore the signs. 2015 is going to be an ugly ugly fire season…. I’m dread it to be honest. We have been impacted by huge wide fires the last several years. I hope we get a break this year, but I don’t expect it. Our long term forecast is pointing to a heavy thunderstorm track in the Sierra in July and August. That really isn’t a good thing. This is very serious indeed!! Indeed, let’s hope for early Fall rains. It is sad. I’m so sorry so many trees are dying so early in the season. We are having some rain now, although there is still a huge 250,000 hectare fire burning nearby. Some changes are drastic and some subtle, but the forest sure seems to be shifting. I hope you get some rain! We’re hoping too. I hope they get that fire under control. We will be in the same boat very soon I’m afraid. Hi Tim, the Little Bobtail Lake fire is 100% contained now. I hope for some rain for your area. We hate to see it, but have heart these forest will eventually recover. It will just take a long time. I hope so! I can’t imagine, how would look the ground, where is my favorite forest. I used to play there as a child and seeing it afflicted would be painful as for me as for many other people. Tim, any solutions? Any hope? What are your views on climate change and what do you think people can do? Yes, there is always hope. Part of the problem is that our forests are overly dense. We just have too many trees competing for resources like water. 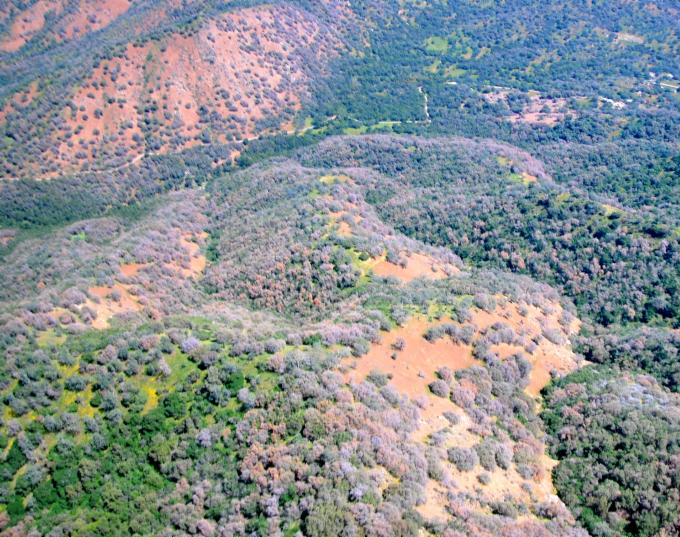 When a drought strikes the trees weaken and become susceptible to insect attack. It used to be that fire regularly burned in our western states and it kept the forest less dense. Large older tree could easily withstand those low intensity fires. In fact, these forest were adapted to regular fires. But fires have been suppressed by people for the last 100 years and as a result, ingrowth of new brush and trees have made our modern forests very dense. Todays summertime fires completely destroy these forest. We can’t reintroduce fire easily because it’s too risky, but we can thin the forest by mechanically harvesting trees to reduce the density. Some work is being done, but we need to do much more. Hi Paula, I got a little off on a tangent and never answered your question about climate change, so here goes. My opinion is this. Climate change happens with or without humankind. The question is how much do people contribute. My answer is, I have no idea. My career in the natural resource profession has gone on long enough for me to see the politicization of environmental science over and over again. It has created in me an inherent distrust of scientific reports when there are such massive political movements driving the discussion. Peer reviewed science falls by the wayside, and consensus becomes the determiner of truth instead of scientific method. It is impossible to sort out the truth in this scientific/political mosh pit. We would be incredible arrogant to think we have this all figured out. Let’s face it, they can’t accurately predict the weather a week out. I can’t believe they can predict a climate pattern 100 years from now. Still you wonder, what can people do. We can manage for climatic changes. For example, in a drying environment we plant more of the native drought tolerant species in our plantings. This is what nature does. Tree and plant species migrate in times of climatic changes. This is nothing new. On forests adapt to the changes. My experience in forestry has taught me that nature is extremely resilient. People often lament that nature is very fragile and I totally disagree. That doesn’t mean that we can treat our habitat with no concern. We are the stewards on this planet and it’s our responsibility to manage to the best of our ability and knowledge. We may differ on what that looks like, but if we all desire a good outcome then we can compromise over the details. “Nature” will be here long after humankind is gone. In the long run time will show us what is the right answer. In the 1970’s they predicted that we were entering an Ice Age. Time proved them wrong. I think one of the great injustices of this is the angst that is created in the hearts and minds of people over a global disaster that may simply be a natural cycle. As the saying goes, “What if change is easier than you think.” I’m just a forester, but I have great optimism in nature. Thank you for sharing this Tim. It is terrible when the nature just die like this here. It is indeed Irene. Much of this could have been prevented with proper forest management. I agree. I lived in a castle with forest around years ago in Denmark and learned, how important it was to manage the forests.